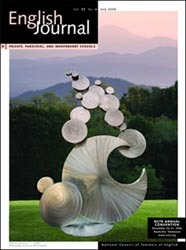 I received my complimentary author’s copies of English Journal, July 2006 (Vol. 95, No. 6) in the mail today. It was very exciting to see my writing, complete with pullout quotes and minibiography at the end. I must say that it is very exciting for me to be published in a journal. It makes me feel so professional! Once I began doing research, I discovered that cheshbon hanefesh was a concept first elucidated by leaders of the Mussar movement, a 19th century ethics movement in Orthodox Judaism. In fact, I discovered that Mussar leaders had been influenced by reading Ben Franklin’s autobiography, and even suggested keeping the same sort of record Franklin kept in his “little book.” This discovery, I think, surprised Rabbi Baker, who didn’t realize Franklin actually influenced the concept of cheshbon hanefesh. During the month of Elul, which leads up to Rosh Hashanah and Yom Kippur, introspection and a sort of moral evaluation are encouraged in the Jewish faith. When teaching American literature chronologically, Franklin’s autobiography frequently falls during this time. In fact, this last year, I was able to have my students begin their “Moral Perfection” journals on the first day of Elul, which would be Rosh Chodesh Elul. During this month, it is important to self-reflect and repent in preparation for Rosh Hashanah and Yom Kippur. Keeping a journal lends itself very well to religious requirements during this time. It is a perfect confluence of Jewish faith and curriculum. For the assignment, students read the “Moral Perfection” selection from Franklin’s autobiography. Students choose a virtue they would like to cultivate or a vice they would like to eliminate and for one week, they write reflectively at the end of the day about their success and failure. Students have the opportunity to be creative. Students have turned in some beautiful artwork and created professional-looking journals along with this assignment. I have even had one student (much to my excitement) do the assignment in a blog. I encouraged him to continue blogging, and I hope he has — I don’t think he felt comfortable continuing in that spot where his teacher could read it (and I can’t blame him for that). There is nothing terribly novel about the assignment. I’m sure a lot of other teachers have done similar assignments with Franklin’s autobiography. What is novel is the close connection to Judaism. When I saw the call for manuscripts, I decided to write an article about the assignment because I felt it had a good chance of being published. Not, as I said, because my idea was so fresh, but because the concentration on how teaching this assignment, for me, was different in a Jewish school. Truthfully, it occurred to me that English Journal might receive few submissions centering on Jewish schools because there are simply fewer Jewish high schools than Catholic or other parochial schools. I admit that I felt English Journal‘s propensity for publishing articles connected with diversity and multiculturalism was in my favor, as well. So there you have it — the story of how my English Journal article was born. If you want to purchase copies of this issue, visit this link. Look for me on p. 33. My copy should be on it's way anyway! How cool to have the inside track! I will peruse it carefully when it gets here. It is always exciting to have something published … congratulations. I'm travelling now, but I'm sure my EJ will be waiting for me when I get home. Mazel Tov!! Can you believe I still don't have a subscription to EJ? I'm ashamed but that'll change! Congratulations, Dana! This is such exciting news! I'll have to check out our school issue ASAP. Kudos!